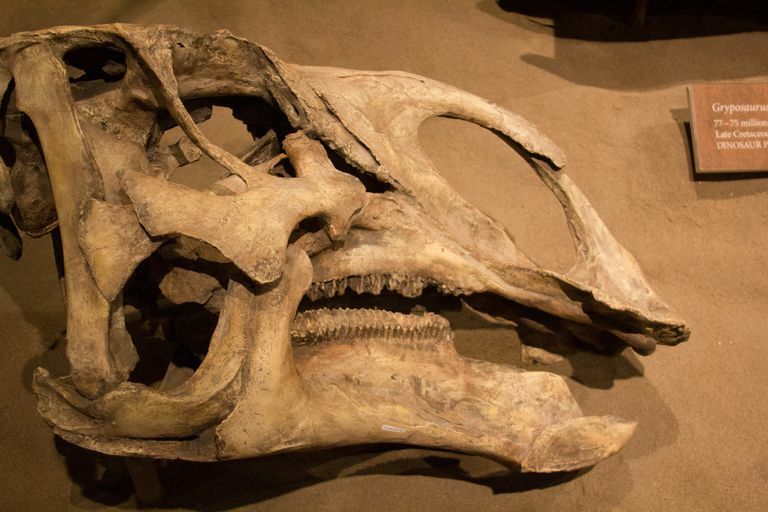 Three complete fossils of the hadrosaur, or duck-billed dinosaur, Brachylophosaurus have been discovered, and they're so amazingly well-preserved that (as paleontologists often do) they were immediately given nicknames: Elvis, Leonardo and Roberta. (The same research team also unearthed a fourth, incomplete fossil of a juvenile, which they dubbed Peanut.) The most completely preserved specimen, Leonardo, is the subject of a Discovery Channel documentary, Secrets of the Dinosaur Mummy. In this show, it's revealed that Leonardo had a birdlike crop on its neck (presumably to aid in digestion) as well as different-sized scales on different parts of its body, among other unique anatomical features. Although it's named for the unusually short crest on its head (short, that is, for a hadrosaur), Brachylophosaurus stood out more for its thick, downward-turning beak, which some paleontologists take as evidence that the males of this genus head-butted one another for the attention of females. This dinosaur is also known for its unique pathology: detailed analysis of various fossil specimens in 2003 revealed that these individuals suffered from an assortment of tumors, and one was in the end-stages of metastatic cancer (which may either have killed this dinosaur, or weakened it sufficiently that it was easily picked off by a hungry Tyrannosaurus Rex).